Can you tell that I’m a little obsessed with my slow cooker? This puppy gets some major use around our house. And you are going to love this recipe! It’s so simple that my 2-year old seriously did 90% of the work. Next time you don’t think you have time to make dinner, take 5 minutes in the morning and pop this in (and 20 seconds to soak the beans the night before), and you will be rewarded with a delicious, comforting meal that’s practically ready to go when you walk in the door. What makes this recipe extra special is the added ham hocks, which you can shred and leave in or remove once they are done cooking. You could also do sausage if that’s more your speed, but I love the smokiness from the ham. If you want to make this super easy, heat up some frozen pre-cooked rice. The rice in the bag that you microwave is an option too, but personally, it gives me the hebegebees. Best option – get yourself a small rice cooker. I love ours and it takes out all the guesswork. Rice, water, hit button, (wait 20 minutes), done. Enjoy! Soak beans in water overnight. Drain and discard water. Place all ingredients (except rice) in slow cooker, cover and cook on low 10-12 hours, or until beans are soft. Remove or shred ham hocks and stir back into beans. 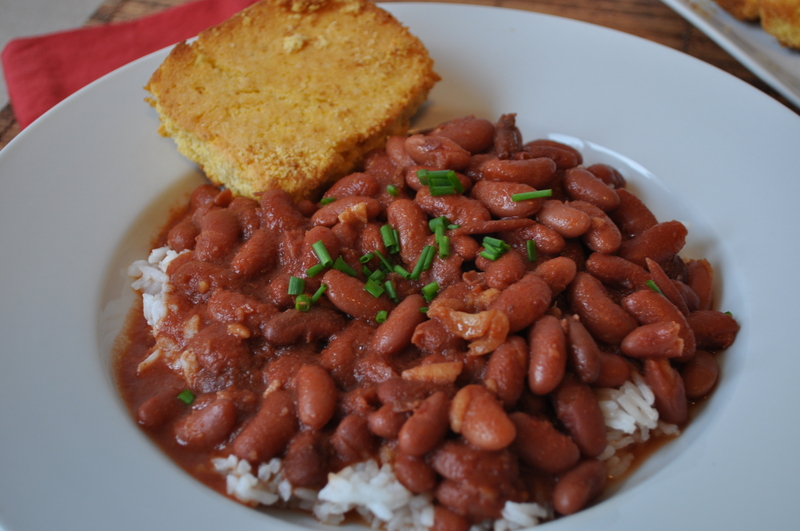 Posted in Dinner, Recipes, Slow Cooker and tagged beans, dinner, rice, slow cooker. Bookmark the permalink. Sounds like something your dad would love! I’ll give it a whirl! The substitute of sausage sounds good too. Believe it or not, my grocer did not have ham hocks, so I used chucks of ham. It turned out great! In fact, there was so much left over that I mixed the remaining beans with some cooked ground beef, tomato sauce and some chili mix for another meal of warm Chili!